While the Lea(R)n team is made up of educators, researchers and technologists, we understand that what’s often most helpful in identifying where you are, where you want to go and how to get there is to understand challenges and solutions from peers in other schools and districts. Product companies claim their tools, programs and systems can do all kinds of things, which is part of why we developed LearnPlatform: to separate the promises from the practice. Check out the research that undergirds the platform, ongoing analysis projects and case studies of real solutions working to make results matter in learning organizations across the country. These full-length case studies details every step of the journey (from challenges and discovery to implementation and results) for schools, districts and organizations that have used LearnPlatform. Danvers discovered LearnPlatform when they needed a better system to analyze which products were being utilized across the district and to vet products based on a variety of criteria, including connections to curriculum and technology infrastructure. ATLIS enlisted LearnPlatform to help gather and share network member feedback on a variety of different edtech products through a unique product library. Elkin City used LearnPlatform to create a wealth of actionable data and comprehensive analytics to begin to understand which edtech was being used across the district. Lipman Middle School ran LearnPlatform's IMPACT Analysis to identify potential savings and student achievement metrics on a widely used edtech product. Silicon Valley Education Foundation used LearnPlatform to efficiently harness the insights of teachers across dozens of bay area schools. The UNC System utilized LearnPlatform to streamline edtech procurement and standardize pricing across all 17 campuses, saving 21% on their edtech in under 90 days. PVSD chose to implement LearnPlatform to build a stronger community of practice around selecting the most appropriate edtech tools for the classroom. Today, it’s used for much more. Salt Lake Arts Academy Snapshot. "Survey of prediction methods to assess student performance." Stanhope, D. S., & Cahoon, J. (2018, July). Survey of prediction methods to assess student performance. Paper to be presented at the 2018 Joint Statistical Meetings, Vancouver, B.C. "Giving educators a voice on edtech: The development of an edtech evaluation rubric for educators." Stanhope, D. S. (2018, March). Giving educators a voice on edtech: The development of an edtech evaluation rubric for educators. Paper presented at the 29th Annual Conference of the Society for Information Technology and Teacher Education. Washington, D.C.
Stanhope, D. S., Rectanus, K., & Yu, J. (2016, June). A Platform for integrating and analyzing data to evaluate the impacts of educational technologies. Paper presented at the 9th International Conference on Educational Data Mining, Raleigh, NC. "Educational technology: What 49 schools discovered about usage when the data were uncovered." Stanhope, D. S., & Rectanus, K. (2016, June). Educational technology: What 49 schools discovered about usage when the data were uncovered. Paper presented at the 9th International Conference on Educational Data Mining, Raleigh, NC. Stanhope, D. S., Rectanus, K., & Yu, J. (2016, August). Automated analytics and data dashboards for evaluating the impacts of educational technologies. Paper presented at the 2016 Joint Statistical Meetings, Chicago, IL. "We're running trials on multiple new technology products across numerous districts with two dozen teachers; LearnPlatform brings much needed structure to the collection process and actionable data to the analysis process." The Lea(R)n grading rubric is a research-backed tool designed by, with and for educators to help them share insights and feedback on the learning technologies they use in their classrooms. See an example of our detailed report on an edtech product's usage and efficacy within a U.S. school. 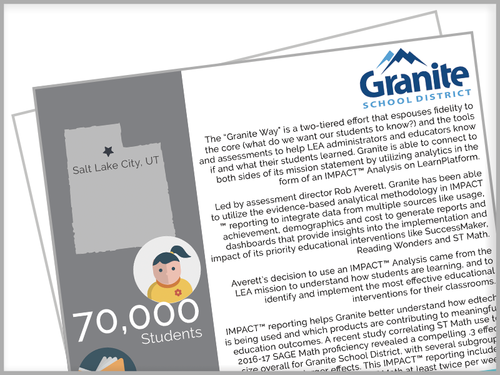 View a sample of our free analytics report for your district. To learn more about both extensions or install, click here.